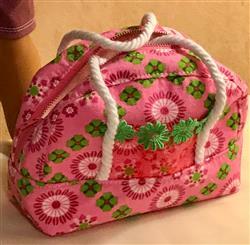 Your doll will have the cutest bag on the team with the Sporty Bag PDF Pattern from Doll Tag Clothing! This bag will be perfect for any sport and features variations for a gathered or flat working pocket on either side of the bag. -Fusible Interfacing: This is only if you are using cotton or thinner fabric. It is to add stiffness to the fabric so that the bag stands upright. CUTE CUTE CUTE!! Easy to follow instructions and loved the outcome. very cute bag, I have made a few of these already, and plan to make more!!! I love this bag. I've made three of them now in different fabrics. A friend has now fallen in love with it and wants one in human size! Turned out real cute. Seems a little larger than I thought woul be for doll. I have been eyeing this bag ever since I started purchasing pixie faire patterns 5 years ago. I finally purchased the pattern and I love it! I had a bit of trouble figuring out the top strip assembly, but once I did, it went together beautifully. My second one was much easier. I will be making more of these for sure. Thanks! So cute and stylish. I have made 6 so far and love them. Thank you for a quick, easy to follow bag.